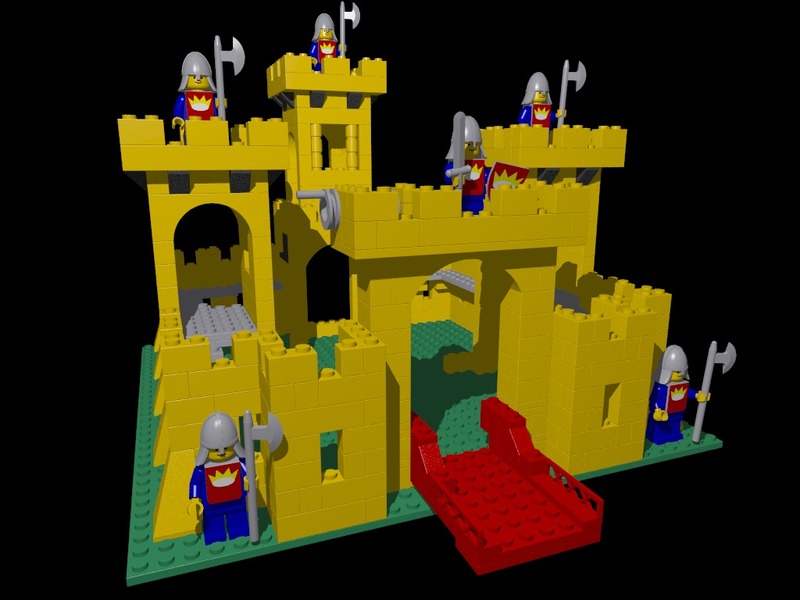 Castle isn't our favorite theme, but Jer has drawn the shirts and faces required for several Castle related minifigures, and I've modelled a few of the helmets and the weapons. To the left is a black knight, showing off a sword and a battleaxe. 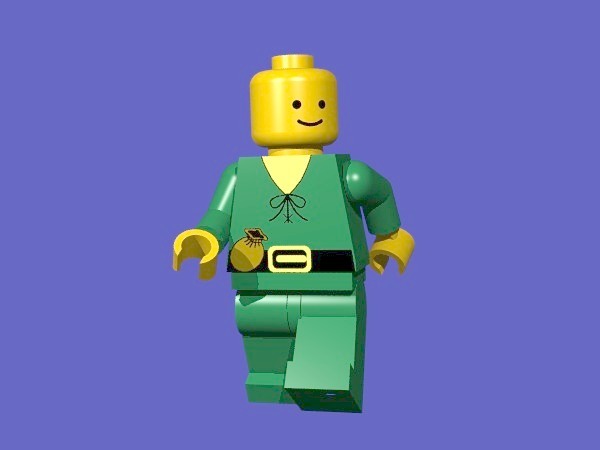 I haven't modelled his fancy helmet, so like many of the raytraced minifigs, he is bald. The 6038 Wolfpack Renegades is my first and only Wolfpack set. Though I really like the 6075 Wolfpack Tower, I haven't justified buying it yet. This image was my first attempt to build a complex LEGO vehicle instead of concentrating on minifigs and scenery. It led me to write the first pass at my brick parsing program that constructs and places most of the ordinary pieces. It won't be converted to my New Improved format until the format supports hinges properly, so that the top of the cart can open up like the real thing. Most vehicles in the Castle Theme seem to be based on blue and black bricks and the brown wagonwheels, so I'm all set to raytrace any that catch my fancy. I should go buy one of those 6044 King's Carriage sets. 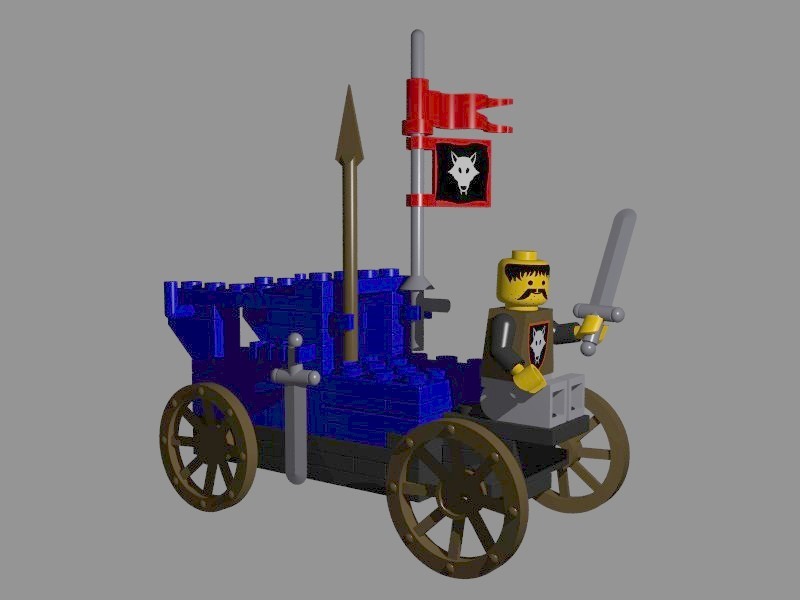 Expanding the Castle vehicle selection is eventually going to require a LEGO horse model. Maybe I'll just use the design in the original 6075 Castle set that uses regular bricks and ramps. I've only worked on one LEGO castle, but you have to admit, if you're only going to raytrace one, the original 6075 Castle is the one to do. Thanks to Rich Bingle for lending me the instructions to this set. The castle is pictured manned by the guards as shown in step 18 of the instructions. The completed model description is 786 lines long (about 20k) and contains 587 LEGO elements. The imagemaps for the body armor and shield are among the very few that are drawn by me rather than Jer. 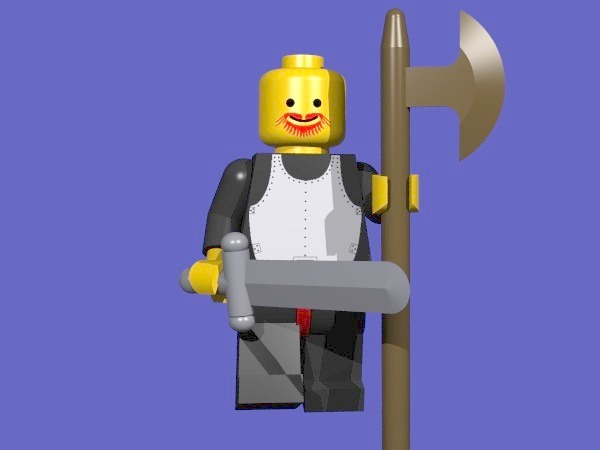 If you're in the Purdue area and would like to lend him the minifigs from this set, he could probably turn out better imagemaps (and do all of the knight styles that I ignored). Send him mail and see what he thinks. This image does have a few shortcomings. The lack of hinge support in the brick parser means that the castle can't be opened easily, but watch this space for alternate images when it can. The requirements for this particular model will figure heavily in the design, so sample images for this set will be among the first. There are also 6 bricks missing from the hole in the front of the rear tower, since I don't have any to model. I think they're similar to the current element which has a recessed hollow stud on the face of a 1x1 brick (but with a square stud), but it's hard to see in the pictures. Oh, and it's actually sitting on a 32x32 plate instead of a baseplate, but it really needs the 5 individual baseplates that allow the model to hinge, so I'll get around to that when it can hinge. I'd like to raytrace more of the official LEGO castles, especially those made of mostly plain bricks (instead of the new wall pieces). If you'd like to lend me some instructions, drop me a line.